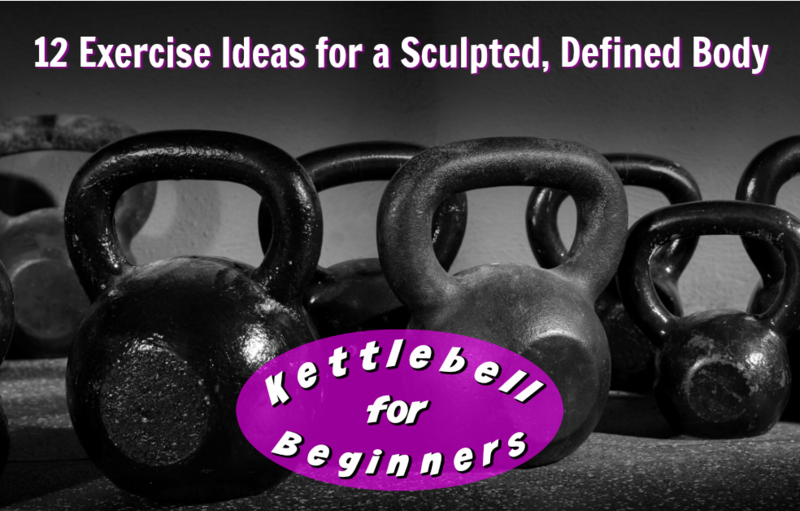 The kettlebell is a simple piece of fitness equipment that has been around for centuries. The genius of the kettlebell is that you only need one to give yourself a great workout. They’re small and inexpensive, yet highly effective for building muscular endurance and burning fat. You can do a kettlebell workout almost anywhere – at home, at the gym, or outdoors. The kettlebell is a round weight with a flat bottom and a u-shaped handle on top. Because the handle is located farther from the center of mass than a typical dumbbell, the kettlebell has the advantage of being perfect for release movements – when the kettlebell changes hands midair – and swinging exercises. If you want to add enormous amounts of muscle mass to your frame, then kettlebells will not be something you use frequently. 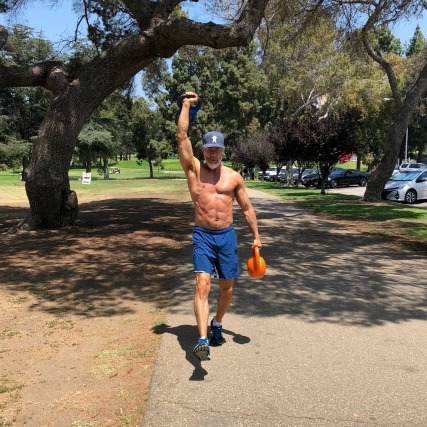 However, if you’d rather have sleek, defined muscles rather than large, bulky ones, then adding the kettlebell to your fitness toolbox is probably an excellent idea. Research studies have validated that the kettlebell is good for helping to remove pain in the neck and shoulders, strengthening the lower back and buttock muscles, and improving general physical fitness – when used properly. 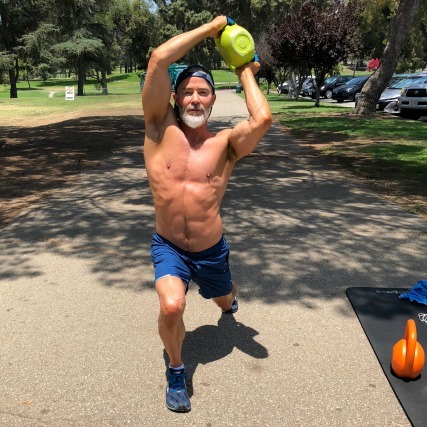 Because the kettlebell is not large or cumbersome, it’s ideal for interval training and burning calories while simultaneously sculpting and defining the musculature. 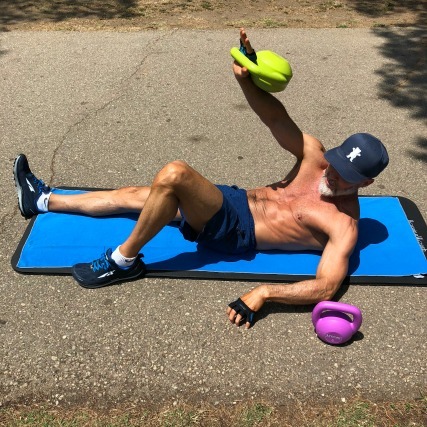 What follows is a kettlebell workout that emphasizes shoulder mobility, so it’s good for beginners as well as athletes over the age of 50. 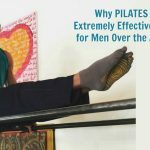 The workout is effective for both men and women. Here are 12 exercises to get you started on a fat-burning, muscle-sculpting workout. 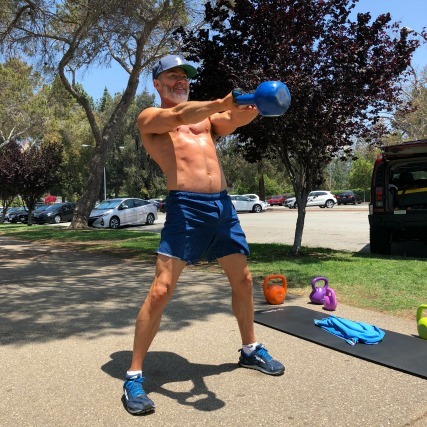 Author Dane Findley, age 53, uses a kettlebell to strengthen his core muscles. 10 full-range repetitions, finishing-up with 10 pulses at the top. When doing your kettlebell crunch, secure the kettlebell on your chest as you lift your shoulder blades off the ground. Initiate the movement from your core, not your neck. 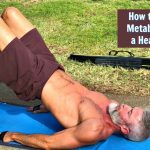 Keep your lower back bolted to the ground and your navel pulled-in tightly. Your legs are straight on the ground, with a slight bend to the knees. Among the biggest mistakes people make when crunching, is shortening their spine. Keep your spine long while crunching in order to give your abdominal muscles room to flatten (instead of bulging out like a punching bag). Bend the knee opposite from the hand holding the dumbbell. No wild movement necessary – it’s more about depth. Concentrate on flattening the waistline and engaging your side oblique muscle. Russian Twists are helpful to do because they mimic some of the actual movements of daily life, such as reaching for your seatbelt, etc. Watch the video provided with this article to understand the “skip,” which is setting the kettlebell down, twisting, then picking it up again. Keep the feet elevated off of the ground. To protect your lower back, keep the navel pulled in tightly the entire time. This is a variation of the Farmer’s-Carry exercise, popular in Crossfit classes. Hold a kettlebell up over your head and walk. However, instead of normal walking, you flex your foot as you step out, then point your toe and raise your heel as you step off the ground. Effectively, it’s a calf heel raise – only harder than it looks. This will tone your calf muscles as it develops your balance. Keep your ribs compressed (not popping forward) to prevent your lower back from swaying. Walk 1-minute out and 1-minute back. 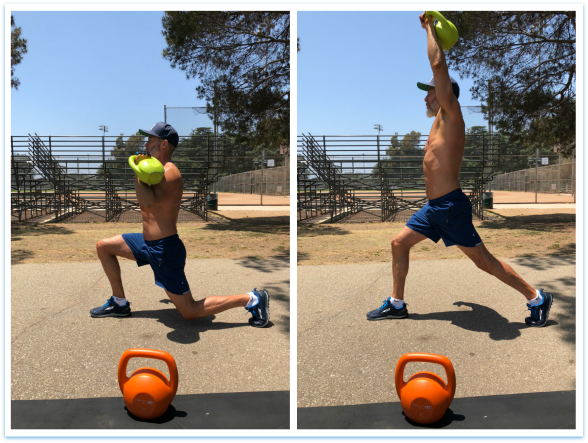 Considered the pinnacle of kettlebell movements, the swing is outstanding at conditioning the body, but only if done correctly. Most of the time, when I see people doing kettlebell swings at the gym, they’re doing them poorly. Usually, they’re turning the movement into a “front arm raise,” trying to use the strength of their shoulders to lift the kettlebell. 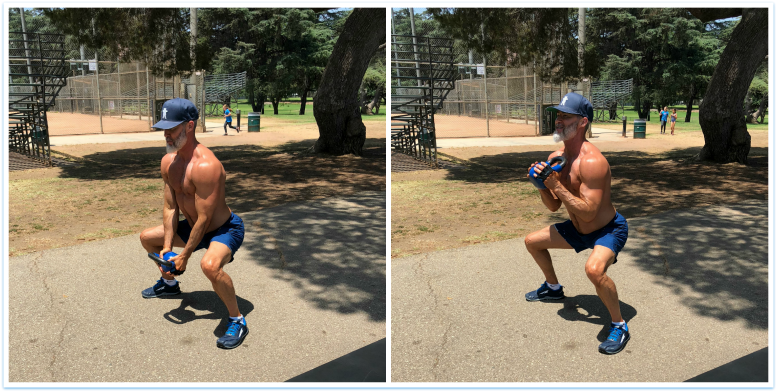 The trick to a good kettlebell swing is to use the forward-and-up thrust of your hips to initiate power behind the swing. It’s a real booty-firmer. Grip the kettlebell securely at your chest as you squat down. Hold the squat at the bottom as you do a hammer curl, then return up to the starting position. Anytime you squat, create some torque in your feet. That means pressing the soles of your shoes evenly into the ground as if you’re trying to turn your feet outward (only, your feet stay in place). Proper squat positioning involves tight abs, activated glutes, chest up, gaze forward. Make sure your scapula is set (no hunching). Arms up overhead, holding the kettlebell behind your neck. No swayed back – keep your ribs compressed so that they don’t pop forward. At the top of each squat rep, do an overhead tricep extension. 1 minute out, 1 minute back. Skip along like you’re a little kid frolicking joyfully – except exaggerate so that your jumps are stronger and your knee lifts a little higher. Looks easy in the video, but believe me, your heart, lungs, and legs will feel it. 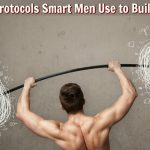 Another benefit to doing these skips now is that it will help release some of the tension you built in your neck and traps during the previous squat exercises. As you press up from your lunge, reach your arm up over your shoulder. Core tight, and try to keep your front knee over your ankle. This time, instead of coming up from your lunge, you hold a deep lunge while you hold the kettlebell and spin it around your head. 10 times each direction, switching legs. Easy does it here. The idea is to improve shoulder mobility, not harm it – so be gentle. Hold the bottom of the squat while you pass the kettlebell around the front and back of your body. 10 times each direction (see video). When your legs start to burn, just remember: that is the feeling of your thighs getting stronger and firmer. Hop in place 30 times. Or, if you have a jumprope, use that. Executed properly with good form, the above kettlebell exercises can help to give you a defined, sculpted body and improve your overall physical conditioning. This entire kettlebell workout can be done in under 45-minutes. For beginners, choose a very light kettlebell weight while you familiarize yourself with the movements. Later, you can add more weight progressively, for increased results.